I may or may not have cooked over 15 cups of quinoa since Monday. I only personally consumed about a half a cup, meaning that I probably over quinoa’d a few people this week. I’m sorry, and you’re welcome. This recipe is simple, elegant, colorful, and keeps a fine balance between sweet and savory. The first step is cooking quinoa, and then tossing it lightly in coconut oil, agave, curry and cinnamon. 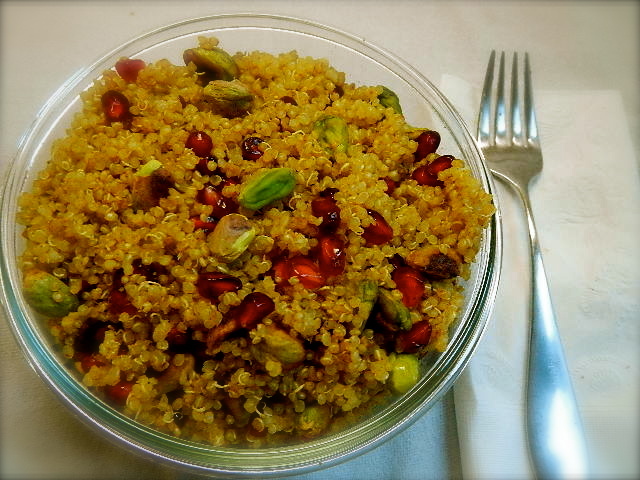 The second step is adding pomegranate seeds and pistachios, in a ratio that makes the salad both flavorful and aesthetically pleasing. Pistachios contain B6 which aids in the process of building hemoglobin and boosts nerve function. Pomegranate seeds are packed with vitamin’s C, K and magnesium.